An investigation is currently underway in Japan over the sale of out-of-date meat. File photo of chicken mcnuggets. THE SCANDAL INVOLVING expired meat sold by a Chinese unit of US food supplier OSI Group has spread to Japan, as McDonald’s confirmed that the now shut factory provided Chicken McNuggets to its restaurants. Shanghai authorities on Sunday shut an OSI plant — a supplier to McDonald’s and KFC in China — for mixing out-of-date meat with fresh product, re-labelling expired goods and other quality problems following an investigative report by a local television station. 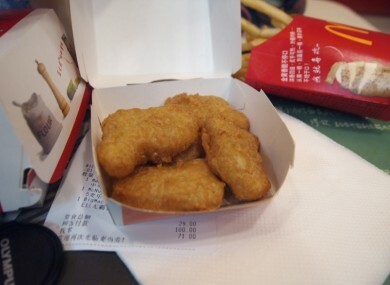 A Tokyo-based spokesman for McDonald’s Japan told AFP the restaurant chain had sourced about 20 percent of its McNuggets from the Shanghai factory, and had suspended sales of its product since Monday. Around 500 of McDonald’s restaurants in Japan, a sixth of the total, had temporarily stopped selling McNuggets while the company obtained alternative supplies, he added. Chinese police were questioning “several” employees of the OSI subsidiary, which is called Shanghai Husi Food Co., in the case, the Shanghai Daily newspaper said. Police could not be reached for comment. Separately, the China Food and Drug Administration had ordered an investigation of OSI’s factories nationwide, according to a statement. OSI’s Shanghai factory, set up in 1996, has more than 500 workers with five production lines for items including pork, beef and chicken, according to the group’s website. OSI is a long-time supplier to McDonald’s in China, starting from 1992, it said. The US company said on Monday that it was “appalled” by the allegations while announcing it had formed a team to investigate. McDonald’s in China said it had “immediately” stopped using the factory’s products while restaurant operator Yum said separately its KFC and Pizza Hut establishments had also halted use of meat from the Shanghai plant. US coffee chain Starbucks confirmed it was supplied chicken by the factory, but had removed the product from 12 provinces and a major municipality in China. Burger King, another customer, said it had removed the meat from its restaurants. In an editorial, China’s Global Times newspaper took aim at McDonald’s and Yum for failing to supervise their suppliers. “Famous international brands have not adopted a dedicated attitude toward Chinese consumers,” said the newspaper, known for its nationalistic editorial stance. The official Xinhua news agency accused OSI and foreign fast food chains of having double standards towards food safety. “The out-of-date meat was given firstly to the Chinese market, sparking doubts over double standards on food safety among the supplier, or maybe fast-food tycoons,” it said Monday. China has been rocked by a series of food and product safety problems due to lax enforcement of regulations and corner-cutting by producers. One of the worst incidents occurred in 2008 when the industrial chemical melamine was found to have been illegally added to dairy products, killing at least six babies and making 300,000 people ill.
Foreign milk powder and other overseas food brands have gained sales in China since consumers believe they are safer and subject to stricter standards. But China has in the last year taken aim at foreign companies in several sectors, ranging from pharmaceuticals to infant formula, over their high prices and other business practices. Email “McNuggets in Japan and Starbucks dragged into out-of-date meat scandal”. Feedback on “McNuggets in Japan and Starbucks dragged into out-of-date meat scandal”.